As reviewed in the Washington Post, "The Myth of the Wicked Slave Trader," by Edwin M. Yoder Jr., on 22 May 2005 -- Harriet Beecher Stowe was hardly the first novelist to contribute a stereotype to American historical memory. But when she fashioned not only the saintly Uncle Tom but also Haley, the slave trader, she gave us a stock figure of unusual durability -- and usefulness. Unlike Uncle Tom's original master, a genteel Kentuckian, Haley is coarse in feature and manner, speaks ungrammatically, dresses with flashy vulgarity and wears rather more rings on his fingers than a gentleman should: a sure mark of underbreeding. Yet Haley's historical utility is undeniable. He reflects our tendency to adjust the unpalatable features of the past to fit our self-regarding myths of virtue and innocence. Carry Me Back is a determined assault on the myth of the wicked slave trader, or at any rate on the widespread belief that slaves traders were a tribe apart, conducting a nefarious traffic that good people shunned. On the contrary, from the advent of the cotton gin in the 1790s to the outbreak of the Civil War, a steady flow of "surplus" slaves from the upper South (George Washington once estimated that there were too many slaves "by a moiety" for profitable farming in Virginia) was a key concomitant of Southern agricultural prosperity. And their transfer required agents, lots of them. Carry Me Back: The Domestic Slave Trade in American Life, By Steven Deyle. This seems an undeniable given. What the trade's corollary vices were is more debatable. The new Southwest's booming market for slaves encouraged some slave-sellers to advertise some women as "good breeders," and it may have acted as an incentive for the kidnapping of freed blacks. Deyle depicts this busy commerce in slaves as a Dixified version of the "market economy" that was developing in other regions in the same period. The Deyle thesis, as it might be called, departs substantially from the view of Eugene Genovese and other senior historians of slavery that the Old South's plantation economy yielded a very different, less commercial mindset. But, assuredly, there was big money to be made, fast. Deyle seems to relish naming the big slave dealers and even informing us that so distinguished a Southern institution as the University of the South at Sewanee, Tenn., was, at the outset, substantially financed by slave-trading fortunes. Otherwise, the author has been unable to document the existence of that bugaboo of the wilder abolitionist imagination, the stud farm where bondsmen were bred like domestic animals. 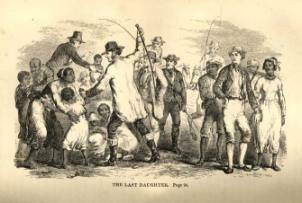 Thus slave traders were needed and were too numerous to be outcasts. Yet there can be no doubt of the tenacity of the stereotype. Even reasonably well-informed students of the history of slavery have internalized the wicked slave trader cliché. I recall being shown a cache of family documents by a close friend, only to realize with a shudder that her archive documented a traffic in selling slaves "south." When I first studied slavery, we were taught that nice people didn't sell slaves unless they were unruly -- the excuse that self-regarding slaveholders usually offered, at least officially, for putting their slaves on the market. But it seems they did, not infrequently and to considerable profit. If he establishes nothing else, the author of Carry Me Back demolishes the notion that the slave labor for the southwestward-thrusting cotton boom was immaculately conceived, leaving all well-manicured hands untainted by the trade. Deyle pays obsessive attention to the horrors of the interstate slave trade -- its pitiful coffles of shackled people being moved long distances, its terrors of family division, its coarse advertising that linked the sale of human beings with that of cattle and horses. Certainly these images were prime tinder for abolitionism. And yet, having initially emphasized the interstate traffic, the author admits that, after all, the slave trade was overwhelmingly local, and as such often governed by comparatively humane and personalized standards: "The overwhelming majority of enslaved people who were sold never passed through the hands of a professional slave trader nor spent a day in a . . . slave depot. They were sold locally by one owner to another." In fact, similar inconsistencies haunt this book from front to back. Perhaps because the evidence is often anecdotal and ambiguous, Deyle takes back on one page what he has firmly asserted on another. Typically he finds it hard to decide just what he believes about "paternalism," the term traditionally used to describe a supposedly benevolent "family" relationship between slaveholders and their "servants." Sometimes Deyle calls paternalism an "ideal" and concedes its sincerity; at other times, echoing an attenuated Marxism, he calls it an "ideology" and implies that it involved false consciousness and self-deception. An historian more inclined toward psychological analysis might speculate that paternalism was an essential defense for people of ordinary morality who must have known, subliminally, that treating fellow human beings as commodities was wrong. Most slaveholders called themselves Christians; and while most were aware (and probably thankful) that no less than St. Paul had admonished slaves to obey their masters, slavery and the slave trade were hard to square with the Golden Rule. At the very least, the paternalist code shielded conscientious slaveholders against feelings of heartlessness. The myth of the wicked slave trader was obviously a corollary and buttress; it implied that the "man-stealing" brokers in human flesh constituted a distinct class, morally inferior to their customers. The record shows this to be an untenable superstition.